Take a break at the Novotel Suites Luxembourg hotel. This family friendly 4-star hotel, situated on the Kirchberg plateau and close to the city centre, is perfect for your business trips and weekend getaways. 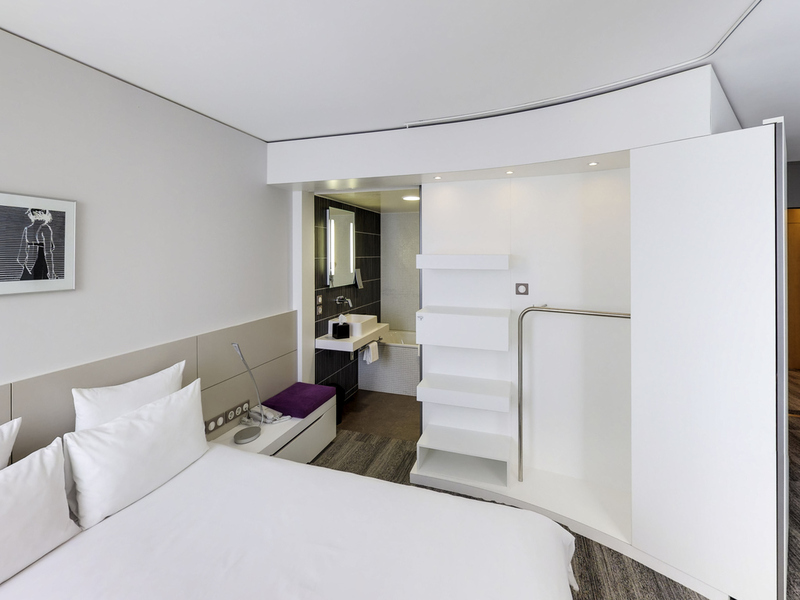 The Novotel Suites Luxembourg hotel boasts spa cious yet inviting modular Suites. The hotel also has a bar and a Boutique Gourmande and a snacking offer for food lovers. Unwind in the fitness room or explore the attractions of the capital of the grand duchy. Les sportifs pourront profiter de notre salle de fitness ouverte chaque jour et les enfants s'amuseront dans le Kids' corner que nous avons imaginé spécialement pour eux. L'établissement dispose également d'un parking avec accès direct à l'hôtel. Le Novotel Suites Luxembourg est proche du Musée d'Art Moderne, de la Philharmonie de Luxembourg, et à seulement 2 km du centre-ville historique. Depuis l'hôtel, facilement accessible en voiture ou transports en commun, il est possible de visiter le Palais Grand-Ducal, le Musée National d'Histoire Naturelle, ainsi que de nombreux sites naturels et culturels incontournables du Grand-Duché. Pour une pause repas ou simplement boire un verre, l'Encas Bar est l'endroit parfait. Et si vous avez envie de soleil, venez découvrir notre terrasse privée : nos plateaux à partager accompagneront à merveille vos apéritifs ! Peckish? 24/24, our Boutique Gourmande self-service offers various snacks and drinks. Feel free to try our products "Made in Luxembourg" as well as our range of organic and vegan. The staff is particularly friendly and thoughtful while remaining very professional. They know best what customer service means and are just excellent at what they do. Thank you! Friendly staff, good breakfast and great room with nice interior. New fresh interior nicely designed. Good location at Kirchberg. I liked the options for breakfast, especially freshly squezzed juice. The room was very clean and bigger than expect, but because of mostly white color in the romm it felt at some moments like staying in the hospital. Room was fine. However, check-in took forever. Last time I stayed with you, roomservice took forever as well and when it finally arrived my order was not complete. Clean, efficient rooms, suitable for the whole family. Good value for money. Easy experience. I like be at the Novotel, as they are situated well for me and they have a VERY friendly staff. I had a good stay at the hotel;The room was nice and clean.Two bed were prepared in addition to the double bed, which were not necessary.The price is still very expensive.There is no proper restaurant, but only a snack which offers however enough choice. I stayed at the Novotel suites from the 28th January until the 1st February. I had such a good experience that I was longing to go back to the hotel by the end of my long working days. I had a very good welcoming, pleasant and helpful staff (mainly Zain at the reception). the experience of a nice massage offered to me on Tuesday when I entered the hotel at 6pm after a long day, was really so great. Thank you for this lovely stay. My family and I feel very confortable. We loved the toys area that you have at the lobby, near to the bar and restaurant. This is a great hotel, and we had very good breakfast. It's good location and easy to park our car. Room is clean. It's walking distance to the modern art museum. The restaurant was open during the Christmas holidays. We are satisfied. Service/bed was comfortable. Stains on carpet an mold in shower. The room, reception and breakfast were very good. Improvements needed for staff in restaurant. I asked several simple questions about the menu that the waitress was unable to answer. For example, I asked what kind of cheese is on the four cheese pizza. The room was clean and tidy. Great shower, odd placement of the toilet outside of the bathroom in a tiny closet. Food options were poor. Staff was excellent. Overall the stay was very nice. However, the floor in the bathroom looked stained and maybe moldy by the shower. I was well taken care of and the people were friendly and helpful. The stay was very short, but very satisfying in a familiar setting.